Gerry is our unlikely hero in When You Went Away, a novel by Michael Baron, published by The Story Plant, a relatively new and different sort of publisher, operated by publishing industry veterans. I received an advanced reading copy of When You Went Away for review, and it appealed to me: I liked the cover, the concept of the novel from the blurb. Because of these two things, I bumped this book up in my review queue. Hey, even reviewers like to read for pleasure now and then. I wasn’t disappointed with When You Went Away, either, so I was glad I bumped it up, but I will say it wasn’t exactly written as I expected it. First, the book is told in a near-memoir style, even though it’s a fiction novel, and the reader gets to go along with Gerry, our protagonist, on his journey of surviving after both his wife and daughter leave him—his wife through death, and his teen daughter through running away from home. Left to raise a near-newborn son, alone, Gerry has to learn how to live again. He was young when he married, and had been married for the majority of his adult life, and now he’s a single father to Reese, the unplanned but much wanted child born just month prior to Maureen’s death. Finding support in his sister in law–who looks remarkably like her sister, a fact Gerry finds both unsettling and comforting at different times–Gerry navigates grief, healing, guilt and redemption, all while trying to define what life without his wife will be and also seeking to understand his now almost adult runaway daughter and the reasons she left home so young. The negatives to this book are few, but there are some. For example, the author, Michael Baron, either is a big Yankee’s baseball fan, or else he’s not one and he overcompensated by providing much too much detail that was unnecessary for the advancement of the story, about baseball and the Yankees. Secondly, the story plods along at a steady, even pace, but it’s often too unemotional, factual, matter-of-fact. In other words, it’s a novel that is most likely a story that will appeal to women, but it was obviously written by and in the point of view of a man. This made it difficult for me, though not impossible, to connect on that emotional level with the characters. The things I enjoyed the most in the book included something as simple as the unobtrusive references to gourmet food and cooking. I liked that Gerry enjoyed cooking. Just goes to show, women do, generally speaking, like a man who can cook well–as evidence by both Gerry’s wife and daughter’s love of his cooking and his new flame Ally’s pleasure in it as well. Of all the characters, the one I enjoyed reading about the most was Reese, Gerry and the deceased Maureen’s infant son. Another stereotype in that women love a man who is tender and kind to children, particularly a man who loves his own children, is proved in my affection for Reese and the manner in which Gerry, through Michael Baron’s writing, talks about his son. Touching, tender and gentle, the moments between father and son in When You Went Away pull at the heartstrings and the tear ducts. The reader never gets to meet Maureen while she is alive, but we learn a lot about her through Gerry’s thoughts and actions, as she informs many aspects of Gerry’s life, up to and including his thoughts and feelings about the woman he meets when he returns to work: Ally. Ally is, in many ways, everything that Maureen was not. Where Maureen was a mother and a wife, married young and had no other lovers prior to Gerry, Ally has had a varied love past, is a career woman, and we later learn, is unable to bear children. Even so, in the ways that matter most to Gerry, the two women share the most important qualities. Ally helps Gerry feel again, though he questions his commitment to Maureen because he feels so much for Ally so soon after his wife has died. It’s those feelings that allow him to see and understand what his daughter might have been feeling when she left home as a teenager, to run away with her love of the moment, Mick. I won’t give away the ending, because you’ll really want to read this one for yourself. I do want to mention, the ending slightly disappointed me, because it seemed to come too quickly, without enough full resolution. I guess that might be a good thing, in that it left me wondering what happened next, but I’m the type of reader who, if there’s not going to be a sequel, would prefer more closure. Short of that, this approximately 360-page book by Michael Baron is an exceptional read, and one that makes me want to watch for more works by this author in the future. 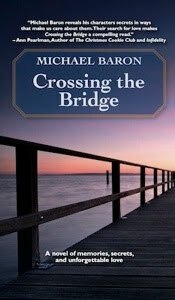 When You Went Away, by Michael Baron is scheduled to be released on October 6, 2009. Amir Makin found Al Islam on an unexpected yet fruitful journey to Africa. Having always been intrigued with issues of the oppressed masses, he quickly learned how this way of life directed all to defend and protect the indigent from tyranny while preserving the dignity of the dispossessed. Since that time, he has instilled in himself and advanced the type of analysis that leads to positive change throughout society. He has since immersed himself in the study of developing solutions to communities most disaffected. He regularly gives lectures and seminars on manhood training and development, and different areas in need of social justice. In the seminars, he explains how to use the tools he has developed to achieve positive results related to these issues. 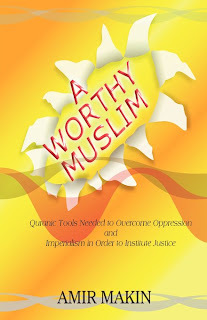 He routinely authors documents about facts on Sunni Muslims and internalized oppression. Amir Makin: First let me thank you for the opportunity to share this information with your readers. I initially got the idea when I began to notice a lack of concern among some but not all within the Muslim community to be committed to work for socioeconomic and political improvement let alone independence with the same intensity as they would use to look for a job. I began to realize that they had problems seeing a connection between Middle East or Iraq or Africa, terrorism and how it relates to our condition here at home. Partly as a result of this, I noticed that several people were getting the impression that Muslims were not supposed to get involved in social, political and economic development. Some Muslims are so ritualistic meaning that they may perform certain acts mandated by Al Islam out of habit without attempting to understand the larger reason for doing such. With this in mind, I asked can all of this be addressed and motivate people toward wanting to understand the accurate facts on Sunni Muslims also? Hopefully once the book is read, we will be one step closer to that goal. Amir Makin: I plan to release 3 additional titles in 2009 to address family issues, leadership/manhood training and development for leadership of one’s community and reducing the recidivism rate of former convicts, so I’m extremely busy. Additionally, I write about some of the internal issues among Muslims that need to be addressed while also covering areas concerning colonialism and oppression throughout the world. I plan to post the links to all interviews, book tour sites and seminars on my blog as they happen. Amir Makin: I thought finally my labor of love has paid off. All of these exhaustive months of research editing, proofreading and re-editing had come to a culmination. Lying awake at night worrying about how best to phrase this or that sentence so it can’t be misconstrued were finally over. After this passed, then I got concerned because it needed to be reviewed at that time. This gave me additional worries. However, good things come to those who wait in patience. True enough the early Amazon reviews were all positive. Understandably, I had a roller coaster of emotions. Amir Makin: What motivates me the most is when I see certain acts of injustice ignored out of some false sense of perverted loyalty to the same. Whether it is innocent people falsely imprisoned, impoverished children being abused or worse, or an entire nation being cheated out of its God given right to maintain and assert its independence, these are the issues that really get my attention, mostly because they are usually left out of mainstream media coverage. I feel it is my duty to do as much as I can to either help correct these wrongs or bring as much attention to them as possible. Amir Makin: This will shock some people, but my favorite author when I was very young was Kenneth Robeson. He wrote the Doc Savage book series and his sense of character development and scene description was some of the most memorable I’ve read. Amir Makin: As I began to get away from fiction, I started taking an interest in nonfiction books related to the struggles of the dispossessed. The Autobiography of Malcolm X is one of my favorite books in this genre. I also like the books by Nelson Mandela, Randall Robinson along with Ralph Ellison’s The Invisible Man. Amir Makin: What would make me the happiest is to see people take my literature, expound on it, grow from it and be able to transform as many negative scenarios they can into positive situations that have exchanged injustice for justice. Amir Makin: Yes I do. On September 15, I’ll be writing guest commentaries on The Book Connection, Scribe Vibe on September 16, interviews for Blogcritics on September 18, Paperback Writer on September 19, Zensanity on September 23 and another guest commentary for Book Marketing Buzz on September 22. I’ll be posting all of these on my blog if readers miss the actual dates themselves. Thank you for the time shared. I was born in Melbourne, Australia to Greek migrants in 1979 and together with my younger brother who is five years my junior, was reared in a somewhat overprotective environment by my grandmother since both my parents worked full time. I quite freely admit I was spoilt from a young age as there was nothing my parents wouldn’t do to satisfy my young ego. If you’re remotely familiar with Greek culture and Greek migrants in particular, this type of red carpet treatment is quite common if not painstakingly regular. Greek parents exist for their children. ‘Everything we do we do for you,’ is something my ears have heard innumerable times over. In their eyes, their dreams are exalted when you succeed in becoming a valuable and successful citizen of society. (Many, if not most traditional Greek parents equate success with the faculties of law or medicine. None other will do.) Despite our differences over the years, and believe me there have been many, I couldn’t possibly fathom my life without them. They have definitely had a hand in shaping me as a person and in turn I have successfully managed to extirpate some of their backwardness and pave the way for their thinking outside of the square. (I’ve given myself a pat on the back for this on many occasions!) You might also say they are my backbone; my Djed Pillar, as the ancient Egyptians would have commended. For me, they are eternal symbols of stability and indestructibility. As a preschooler, I had much difficulty communicating with my fellow peers and teachers because my knowledge of the English language was very limited. I only spoke Greek at home although in time this wrong was righted. By the time I reached second grade, I was competently bilingual. In 1988, my parents decided to move me from Keon Park Primary School in Reservoir to St Johns Greek Orthodox College in Preston, a school known by the Greeks of Australia for its strong cultural and religions ties to the motherland. It was a decision that was fuelled by the influence of my aunty – my dad’s sister – whose children had been attending the institution since preps. I completed my VCE (HSC) and graduated from St John’s in 1997, going on to complete degrees in Behavioral Science and Professional Writing at Latrobe University. I used to think that the biggest mistake of my young life was studying a field (psychology) in which I had no invested academic or emotional interest. That half the course was based on statistics, a subject that never failed to evoke endless yawns from a lecture room full of students, didn’t help either. In hindsight studying psychology was probably a necessary precursor in my voyage of discovery and it was many years before I rediscovered the sparks in which I had excelled at in high school; Classics and English literature. I am indefinitely a man of the arts rather than of the sciences. As a person, I am both easy-going and down-to-earth. There are no surprise packages here. What you see is what you get. (I’m not one who turns out to possess a dark secret, double life or works under false pretenses.) I am lively, fun-loving and even goofy and aloof at times. I adhere to a high standard of personal morals and ethics and expect the people I associate with to do the same. I respect and honor those who return the favor but above all, respect and honor themselves. I am empathetic and compassionate; something which I feel is evident in the line of work I choose to be involved with. (I work for Drug Safety Services in Collingwood and help injecting drug users get onto methadone/buprenorphine programs and access community services which are otherwise reserved for the mainstream community.) My interests are wide and varied, encompassing physical activities like thrill seeking, diving, playing sports, working out and biking that are balanced by my critical inquiry into world mythology, world religions (both east and west) including early Christianity, Neo-Platonism, Gnosticism, Hinduism and Buddhism, history and archeology (both mainstream and alternative), English literature and ironically, Jungian psychology. I also love occult studies and have spent much money on acquiring books on magic and reincarnation. Just like the ancient Greeks, I wholeheartedly believe in concurrent training of both body and mind to achieve a state of balance and wellbeing. In the last five years or so, I have also succumbed to the seduction of travel, an interest which has fuelled a treasure trove of experience and has spurred me on to write about them creatively. I have penned many destinations around the world: America, Europe, and Africa, and have traveled extensively within Australia. I plan to travel to French Polynesia in November and Borneo early next year for what promises to be an awe-inspiring jungle adventure. Paul Kiritsis: Yes I do! I work for drug safety services in Melbourne’s inner city region. We offer primary health care services for injecting drug users who more often than not, are a marginalized minority of our society. These include medical and dental services, counseling, allied health, family support and pharmacotherapy. For accommodation and legal services we refer elsewhere. I have learnt so much working there and have seen things others wouldn’t see in a lifetime of traversing the city streets. What’s certain is that I will never take anything for granted ever again! I have been involved in pharmacotherapy for five years now. Before that I was working as a barman and waiter in some well known inner city cafes. Paul Kiritsis: I’ve always known that I would eventually end up writing. When I was a teenager I was captivated by the flamboyant lifestyle of the journalist and pursued it until the time of my graduation when I realized that it was all that movies and books made it out to be minus the glamour part. I wasn’t too enthused about working under a huge amount of pressure with the added stress of strict deadlines either. I’m hopeless with deadlines and appointments in general. I’m never on time. Paul Kiritsis: I’ve released two so far. The first is a poetry collection titled Origin: Poems from the crack of dawn (2006) and the other is a literary collection called Hermetica: Myths, Legends, Poems. (2007) Both are united by my love of ancient wisdom. Origin is probably the more generalized work of the two, dealing with aspects of life like love, friendship, hate, wisdom and greed. There is also much on religion, philosophy and mythology. Hermetica goes a step further and hones in on Egyptian mythology, Hermetics and esoteric knowledge that Egyptian culture was famed for. It culminates with seven stories written in verse prose that work to form bonds with known Egyptian myths and are a testament to the power of ancient folklore. All of them are original; they can be found nowhere else. Paul Kiritsis: Yes I am. I’m working on a book called Fifty Confessions which will be out by January. It is my most personal work to date; not to mention my most confessional. I am really looking forward to releasing it. It is a huge shift from my other two books – raw and visceral prose. I am also working on a non-fiction autobiography/memoir titled Shades of Aphrodite which relates to my travels through Greece, a country I regard my second home. I have an intimate connection with the Hellenic land and try to provide insights into the psyche of a culture that is not to be found in any other textbook. That will be out after Fifty Confessions. Paul Kiritsis: Yes, I won a literary award for Hermetica: Myths, Legends, Poems with Reader Views. I came first in the categories of fictional poetry and best Australian book. Paul Kiritsis: It’s really weird seeing your name on the cover of a book for the first time. My first reaction must have been, ‘Wow, I’ve done it!’ What I take great pleasure and comfort in is that a few centuries from now, my books will have hopefully survived in libraries or personal bookshelves for others to read. The act of opening up a book and reading its contents in a way reinvigorates the psyche of the person who wrote it. The ancient Egyptians believed that you caused one to live again merely by reading out their name aloud. Indeed, the pen is mightier than the sword. I take great comfort in this. Paul Kiritsis: I write in complete silence. Music, television or radio is just too distracting for me. Some people can do it but I can’t. I’ve tried to write with classical and relaxation music before; it’s only worked the few times that I was in a zone. And that was with poetry; not prose. On other nights I found that it would just put me to sleep. Paul Kiritsis: The colorful past and my adopted spiritual mother; Egypt. Paul Kiritsis: Yes I did. I liked reading a lot of fiction when I was a teenager. I would absolutely love getting lost in the pages of Dean Koontz and Richard Laymon novels. I’ve read most of Dean’s work and all of Richard’s. My favourite from each was Phantoms and Funland, respectively. I think Funland was shortlisted for the Bam Stoker Award. I know he actually won the award in 2001 with the Traveling Vampire Show. Dean and Richard have inspired me beyond comprehension. Paul Kiritsis: I don’t really have a favorite author now. There are many great books around. I try to read works from all areas of literature: fiction, non-fiction and poetry. I am mainly interested in non-fiction/spiritualism and occult works at the moment. The last book I read was Mister. B. Gone by Clive Barker. I read it all in one go. Very interesting book I might add. Paul Kiritsis: Well, I live in a house built on a hill overlooking a golf course. It was designed and built by my parents and is a testament to open-style living. There aren’t many walls or rooms in the house and there are many windows which makes it well lighted. My glass writing desk sits in the lounge room and overlooks a spectacular view of the golf course and the surrounding Melbourne hinterland. There isn’t much spare room on my desk as it’s usually clogged up by books that are stacked one on top of the other in messy piles, my laptop, a lamp, an incense burner, pens, notebooks and other research materials. I love burning incense or oils when I write. It’s so relaxing and never fails to induce a copious amount of inspiration. Paul Kiritsis: Yes, there is. My mother and father, Christos and Chryssoula, for their unyielding support and my cousin, Harry Toulacis, for the inspirational chats and all the hours he spent reading and re-reading my work and offering his constructive criticism. I thank them all with requited love. Paul Kiritsis: Yes! The DaVinci Code by Dan Brown…I think everybody wishes they’d written that. Look where it got him. Paul Kiritsis: My primary purpose is to gain acknowledgement and credit in the fields I choose to write in. The other is to meet somebody one day who tells me, ‘I read one of your books and it inspired me so much that I wrote one of my own.’ That would be a reward unto itself, making my endeavors all that much more worthwhile. 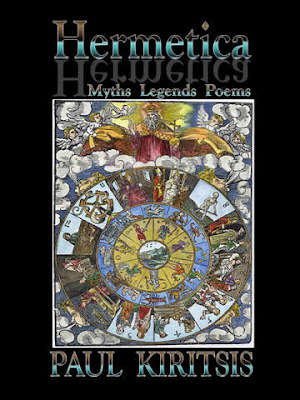 Paul Kiritsis: Hermetica: Myths, Legends, Poems is a real-life compendium of morals and lessons. Each literary piece weaves its own tale and brims with meaning and life lessons which are there to be comprehended by those whom possess a keen mindset. Now that you are a published author, does it feel differently than what you had imagined? Paul Kiritsis: You want the honest truth? No. I always imagined that I wouldn’t change, no matter what came about in my life. In actual fact, I don’t feel any different to what I did before I was published. I am still the same person with the same personality traits, weaknesses, emotions, fallacies, hopes, aspirations and dreams. Now, use this space to tell us more about who you are. Anything you want your readers to know? Well I am of Greek origin if you haven’t already guessed. My parents migrated to Australia in 1978 and I was born and bred in Australia. I am bilingual; I speak, read and write Greek. I have traveled extensively within Australia, America, Europe and have touched on Africa. I am an open-water diver – a true Cancerian with a love for the ocean and water in general, despite the fact I nearly drowned swimming around the Santorini caldera in the European summer of 2003. I love keeping fit and body sculpting – I am a fitness instructor. I have been tutored in the language of music; I can play the piano and organ and have to my credit a fourth grade certification in musical practice and theory (ANZCA). I love stimulating conversation on world religions, philosophy, mythology, ancient history and the occult, and love being challenged by people who are interested in the same areas of inquiry. I am also a lover of controversy; I’ve been branded outrageous on many occasions. I am an all-or-nothing person; a man of extremes. I love my thrill seeking and adventure. I consider writing to be an extension of me. 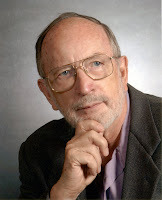 If you would like to know more about me, please do not hesitate to visit my website at www.paulkiritsis.com or send me an e-mail. There is a plethora of material on my website: reviews, sound clips of me reciting some of my favorite poems, commentaries, interviews that I’ve done, analyses of some of my work, a short autobiography and a section on upcoming releases. My books can be purchased either through my website or through Amazon.com, BarnesandNoble.com and iUniverse.com. Please do not hesitate to contact me if you have any queries. When I picked up the book by Charlie Hills, Why Your Last Diet Failed You, I thought, Great, yet another book on dieting. Then I read the subtitle of the book: “And How This Book Won’t Help You on Your Next One”. My thought on that was, Huh, well, at least he’s honest. 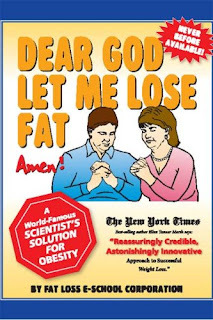 Not only did I find the cover of Why Your Last Diet Failed You amusing, but I also found it honest, and that’s what you’re going to find inside the book. That is, essentially, what the very foundation of this book, yet another book on dieting, is all about: honesty, with a dash of humor, and it’s calorie free. One thing that stood out when reading the book is that Mr. Hills makes it clear upfront his isn’t a miraculous weight loss story. He’s never weighed 400 pounds, had a near death experience, or any of the other amazing and heartwarming stories we see in late night infomercials from people with whom we cannot relate. Instead, he’s just a normal American human being, who, like the majority of Americans, has been battling the bulge and the “trampoline” weight loss and gain, and he found himself loosing the war. Mr. Hills documents his own ups and downs, valleys and peaks, while also tackling many of the common diets on the market today, all of which he highly recommends. The point he makes is that any diet when used properly as a tool in weight loss and maintenance, is going to be as successful as you make it. Mr. Hills reiterates what we all know: the only way to successfully loose weight and keep it off is to eat less and healthier and move more. It’s not really rocket science, and he doesn’t really tell us anything that we don’t on some level already know, but he makes it clear from the beginning he isn’t going to do so. Unlike many of the popular diet plan books, you won’t find a lot of science and facts and figures here, although behind Why Your Last Diet Failed You there is plenty of evidence, research and facts. The difference here is the personal anecdotes, the humor and the human struggle that let’s you share the journey with the author. On the downside, sometimes I felt Mr. Hills’ spent too much time sharing is own personal journey, so that it read in places more like a personal journal than I had expected. On the upside, I enjoyed the book as a whole, and there were places in the book where I myself nodded my head in a knowing manner and other places where I literally laughed at loud. If you’re looking for a book that is going to provide you some sort of magic weight loss formula, Charlie Hills’ 210-page, glossy cover, perfect bound paperback from Lockshire Press isn’t going to do it. If, however, you’re serious about losing weight, keeping it off, and laughing with Mr. Hills and at yourself a little bit along the way, this book can make the journey funnier, while letting you know you’re not alone in your experiences. 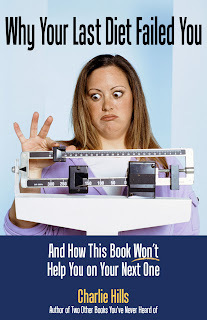 Pros: Humorous, realistic, practical… this book will make you laugh, might even motivate you to lose weight, and even if it doesn’t, provides enough entertainment value to make it worth the read. Con: The book is a bit pricey with a retail listing of US $22.95, and an Amazon.com listing of $14.95. To read Michelle Devon’s interview with Charlie Hills, author of Why Your Last Diet Failed You, click here. Today, we once again welcome our guest blogger, Jennifer Walker, to share one of her book reviews. Be sure to stop by Jenn’s site and say hello! 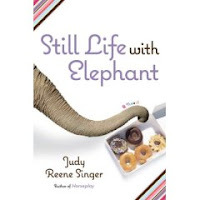 Still Life with Elephant is Judy Reene Singer’s second book, and after reading Horseplay, I had to run out and buy it as soon as it came out. Ms. Singer has a witty and lively writing style that makes me want to read everything she writes—I’d settle for shopping lists at this point! Still Life with Elephant is a slight departure in style from her first book in that it has a much more somber tone. Neelie Sterling recently learned that her husband, Matt, is going to be a father—with another woman. Now, she is struggling to pay the bills and mend her heart by throwing herself into her horse training business. When she learns her wandering husband is headed to Zimbabwe to rescue an elephant, she decides to go along in hopes of also rescuing her failed marriage. Ms. Singer takes the reader on an exciting ride to Africa to obtain said elephant, but the story doesn’t end there. Once the elephant is home, Neelie must tame her so she can become a safe member of the animal sanctuary where she now lives. Meanwhile, her relationship with Matt and the sanctuary’s benefactor become more complicated. The introspective nature of Still Life with Elephant touched me deeply. My heart ached right along with Neelie’s, and I felt as though I was a part of her successes. I related to her hearing problem (or is it more of a listening problem? ), because I often do the same thing. Neelie is incredibly real, with real-life problems—even though those problems come in a package most of us are not familiar with. Many of us have struggled with warring emotions and major life changes, and Ms. Singer presents them very poignantly. Neelie is likable, someone I could imagine having as a friend, and I missed her as soon as the book was over. Although the overall theme of the books is somber, there are some light moments where Ms. Singer injects her delightful sense of humor. There are some wonderful interactions between the characters and enough lightness to keep the book from being depressing. Still Life with Elephant is a journey. Neelie travels many miles, and in the end she not only rescues her elephant, but herself. She enters a new era of her life, leaving behind many of the trappings of the old one. I greatly enjoyed taking the journey with her and felt as though I’d changed a little myself by the time it was over. I highly recommend it, along with Judy Reene Singer’s first book, Horseplay. Today, Jennifer Walker is going to be our guest blogger, with her short review of the book by Meg Cabot entitled: Size 12 is Not Fat: A Heather Wells Mystery. Ms. Cabot’s book has received a starred review from Publisher’s Weekly and has an excellent sales ranking on Amazon, with an average customer review of four stars and shows 74 current reviews. This 368 page, perfect bound paperback book has a suggested retail price of $12.95. Thanks for guesting with us, Jennifer – Hope you’ll come back for more! Heather Wells once had it all. She was a minor pop star, her boyfriend was one of the most desirable men in the country (for the under-18 crowd, anyway), and she had all the money she needed. That is, until she decided she wanted to have more control over her career and image. At that point, she lost her recording contract, her boyfriend, gained a few pounds, and her mother ran off with her money. Now, she’s on her own. With no marketable skills, she turns to a job as assistant dorm director at a college in New York. Although she’s one of the most competent people to ever hold the job, or maybe because of it, the residents want her out of there so the old assistant will come back and let them get away with anything they want. Heather’s job suddenly becomes more interesting when a young female resident is found dead at the bottom of the elevator shaft. Her death is chalked up as an accident from “elevator surfing,” but Heather knows something isn’t right—daredevil boys elevator surf, not preppy girls. Heather is determined to find out who the killer is before he strikes again, but things get scarier. Another girl dies, and soon Heather’s own life is in danger. Despite the murder mystery, Size 12 is Not Fat is a light and entertaining read. I love the concept of the main character, a glimpse of what happens to a star when she loses star status and has to walk amongst the mortals. She’s just famous enough that only some people recognize her, and others look at her and wonder where they’ve seen her before. She struggles with the same self esteem issues so many of us do, but she has a strong enough sense of self to hold out for what she wants, and to stave off the advances of her cheating, yet hunky, rich and famous, ex-boyfriend. Meg Cabot kept me engaged and entertained through the whole story, making it hard for me to put it down. The dialogue is catchy and the plot is unpredictable. I have a horrible habit of trying to predict what will happen in every story I read or watch, and I didn’t hit the mark through this whole book. I felt connected to Heather and enjoyed exploring the mystery with her, reveling in her triumphs and cringing at her failures. I really enjoyed Size 12 is Not Fat, and I plan to read more books by Meg Cabot, such as The Boy Next Door, Boy Meets Girl, and Every Boy’s Got One.